From Friday, January 20th 2017. the United States have a new President – for many, not only in America, still at least controversial and in the extreme version: totally unacceptable Donald John Trump. 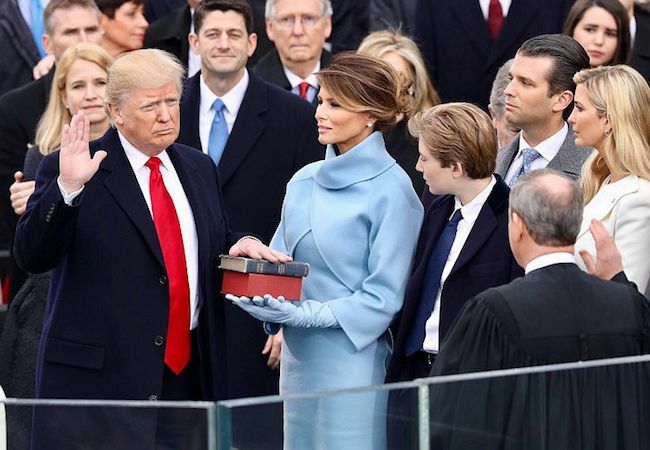 In a precise ceremony in front of the Congress Trump gave his oath and delivered his first speech as head of state. And for everybody who is not biased or has not become prisoner of prejudices, he announced a complete turn in regard to the US policy, as it was until now. This turn can be detected in a couple of key messages which are, admittingly, populist, but not without a deeper political contents. Had he said nothing more, this speech should be remembered. Therefore it is absolutely wrong when the reporter of the German public TV (ARD) says this was not a presidential speech at all, but only a continuation of the election campaign. By the way it would be interesting to hear what would this so called liberals say had he after the inauguration changed his rhetoric and contents. They would lament about hypocrisy and not-consistency. But, as Trump remained consistent, they wrote him off as somebody who did not grasp at all that he is the President and is just continuing his campaign. But, objectively speaking, the messages we mentioned have – for everybody willing to hear them – mark not only the beginning of what Trump described as the necessity to turn form empty words to deeds. The core of his economic policy can be detected from the short slogan “buy American and hire American”. And only after being 30 minutes in office he put into question the multilateral trade agreements for American continent and Pacific region, confirming what he announced during the campaign, namely that he prefers a net of bilateral trade agreements instead of those multilateral. He did not mention any of the concrete problems he will confront as President, such as relations with Russia or health insurance system in the US. But, it was a programmatic speech, based on crucial messages and principles. He did, however, mention radical Islamism (not Islam, but radical Islamism), promising that he would eradicate it from the face of the Earth, for which he will without any doubt need cooperation from Russia. He repeated that he will create new jobs in America, he spoke again about the decline of former US industrial centres (“inspiring” the German television to say that this is simply not true, but forgetting how many times we had seen the empty fabric hales in Detroit and empty streets in the now declining and many years ago prosperous American cities). And he promised, once again, that he will change this situation, that he will build new highways, new bridges, new railroads. Some objected immediately that he did not say: how. It would have been almost a miracle had he done so in a situation when many of his planned members of the US government still lack the Congressional approval and when even some of them voice opinions quite different in regard to his own. Be it, as it is, Trump has his vision of the future and he outlined the corner-stones on which he intends to build his vision, despite his critics who were not hesitating to say that he does not understand today’s world. Some analysts heard in his words the echo of the inaugural speeches of the most famous American president of the 20th century, Franklin Delano Roosevelt and some said they had the impression that Bernie Sanders, the “apostle” of the democratic socialism in America is speaking through Trump’s mouth. We would dare to go even one step further. If we put aside Trump’s person and the fact that he is extremely rich, and if we forget his repeated mentioning of God at the end of his speech, we can come to one conclusion only: what was said by Donald Trump should be embraced by every liberal leftist in the world. Caring for ordinary, forgotten people, wealth for everyone, equality between all people (“we can be black, brown or yellow, but we all have the same red blood”), transformation of a system which benefited the politicians, while the middle class suffered, starting of new production, the transfer of power, it is worth repeating, not from one political party to another, but from the Washington elite to the people, all this can be seen, let us not deny this, as a populist, if not even a nationalist approach. But, at the same time it is closer to the left side of the political scene, than to the right one. These are the first impressions based on Trump’s inaugural speech. But, let us make one thing crystal clear. This is not a noncritical pledoayer for Donald Trump, who has many minuses – from the total lack of political experience, the unnecessary and potentially dangerous antagonizing of the People’s Republic of China to the very dubious hints about his energy policy or his standpoints about the global warning phenomena. But, at the same time it is a pledoayer for much needed and long overdue change of American policy which made the world unstable and insecure and which made the global terrorism a real threat for everybody and everywhere by accepting the protagonists of this terrorism as allies in its projects of toppling the regimes in the Middle East. Yes, such a change, even if it would be Trump’s turn, would be mostly welcome. Of course, if he delivers, what he had promised: it stops here and it stops now. In only a few months we will know if he would be able to transform into reality his vision of America and its new role in the world. Not more: just a few months. After that we will know if Trump’s turn can become a success, or not. And his voters will know if he was right, when he promised them on the Inauguration day. “I will never let you down”. The contemporary debate: Could India be a member of NSG?